Because a gift card just doesn’t cut it sometimes! To help avoid that last minute panic this year, here are some creative ideas to get you started for that foodie on your list. Who wouldn’t love a hostess gift that includes a basket loaded with fresh simple ingredients for the next morning following a dinner party? Pick me! We filled this adorable Italian-made Uashmama washable cloth bag with a small vintage cutting board (this one is from Dreamy Whites Lifestyle), a vintage-style spreader, farm fresh organic butter, a baguette, juicy berries and a half-dozen free range eggs. I mean, is it camping or ‘glamping’? Who cares when you have ADORABLE camping gear like this! Wouldn’t this make a perfect wedding gift for the couple who loves to live outdoors? This Staub cast-iron pan and olive wood spoon is paired with enamel look-alike mugs, a ceramic egg carton, white towel (perfect for camping….ok settled, it’s GLAMPING for the record! ), and of course a plaid blanket. Cuteness overload! 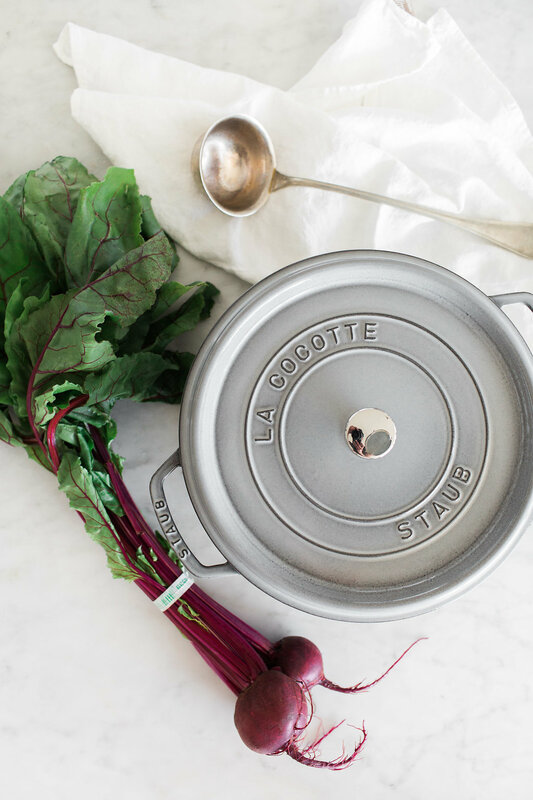 These mini Staub cocottes are my everything (they come in a bunch of colours, but of course my fav is white)! And why not bundle them with all the fixings to make homemade apple crisp? 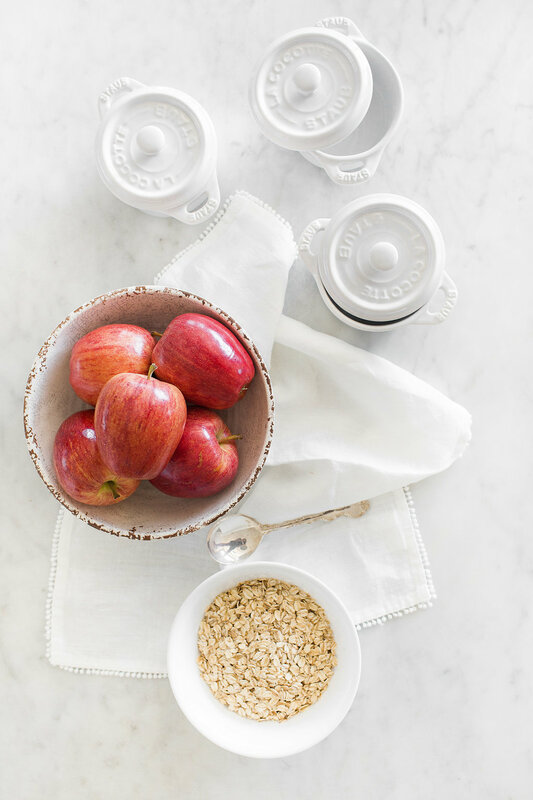 A bag of good quality oats and flour, gourmet cinnamon, a bundle of apples, fresh butter, brown sugar and of course, a sweet linen towel or napkin. I can smell them baking now! There are gifts….and then there are GIFTS. You know what I mean!? Anybody who spends time in the kitchen will be blown away with a Staub Cocotte (this one is the colour graphite, my fav!). Such a statement piece to last a lifetime: a true work of art. One of my favourite ideas is to add an old recipe like this one for our Granny’s Borscht (or your own family recipe, hand-written of course) with a nice dish towel and a classic soup ladle, perhaps from a local antique store to add character? I love dinner parties, but since having kids I have to say that breakfast parties are just as much fun (insert roaring laughter from everyone WITHOUT kids)! There’s nothing like a new, high-quality crepe pan like this Staub pan, and we love the addition of an apron, some farm-fresh eggs and a can of maple syrup. Ooo la la! Good food doesn’t have to be complicated. Take croutons for example. You could buy croutons, but why would you when they are so crazy simple to make and taste a gazillion times better than anything on the shelf. 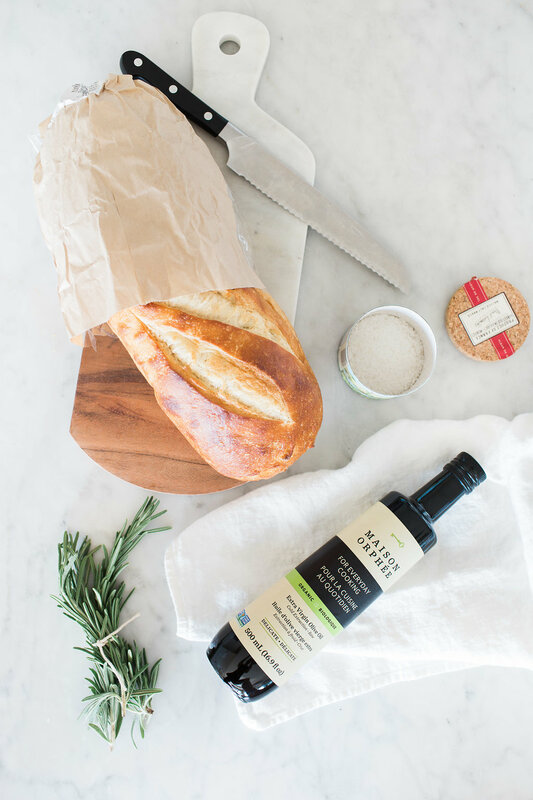 Some good quality olive oil, sea salt, French bread and a bundle of herbs is all you need, but if you really want to impress, a gorgeous marble cutting board and a quality bread knife will knock their socks off. Buying wine is great (who doesn’t love wine!?). But why not make it more interesting? Tell a story by purchasing a mini-series of wine (like this amazing Sandhill duo, how cool would this be ‘open ONE on your first year, and TWO on your second anniversary?) with instructions to open the bottles at a certain date, like a couple’s first and second wedding anniversary? Add some good quality wine glasses, a nice wine crank, and your favourite cookbook with something endearing written inside the cover and you’ve just upped your gift game. People who love tea aren’t too different from those who love wine. They usually have a very strong opinion about tea and how it should be served and of course like very specific types of tea! And what is a cup of tea without a biscuit? Bring out your inner Martha Stewart and whip up a batch of scones to place in a small wire basket lined with a crisp white napkin, bundled with a couple of simple white mugs and a spreader with some fresh cold butter. You could even add in a gorgeous tea pot if you’re feeling like going above and beyond! Grocery shopping is simply a different experience when you own a French Market Basket. I highly recommend the ones by Dreamy Whites Lifestyle, they are as classic as they come and are so well made. Fill it with a couple of your favourite cookbooks and a sweet little notepad to bring the joy back to grocery shopping for the foodie on your list! Thank you to Zwilling for donating the stunning Staub and Zwilling products for this post and to Sandhill for the wine! These are definitely GIFTS! What a great selection, thanks for sharing these ideas. I just told my husband to look at THE gift for the Gourmet Chef “hint hint” 🙂 Thanks for this! So excited for the 12 days… giveaway. Edible and drinkable gifts are the best…great ideas! Love the selection and something I would love to receive as gift. Such great gifts! It doesn’t get any better than this! Hi Liz, I’m so sorry to hear this! I haven’t posted a ton but you should have received at least a couple. I changed it so that people would only receive the roundup posts, but am going to add the option to get an email every time I post for those who want it! Sorry about this, I’m on it!